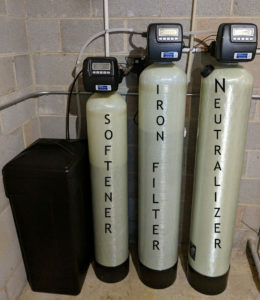 This family in Candler had big time issues with their water, and decided to go with an Iron filter, Neutralizer and a Softener from Mountain Water Systems. They were having problems with staining, discoloration and also water hardness. We tested the water (Free Testing) to find the pH was low (acidic water), iron levels and hardness are high too. They followed our recommendation and we installed a Neutralizer (low pH) for discoloration, Iron filter for the staining and Water Softener for the hard water issue. They were blown away by the improvement of their water in such a short period of time. There’s a reason why we are number one in Western NC, American Made products and great customer service.